So I was walking around in Target today when I noticed the sell bandannas in the 2 pack. And the two pack carries a red one and a blue one. Is it the blood/Crip pack. 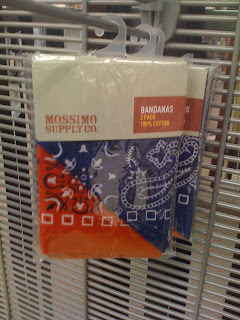 Get booth blood and crip affiliated bandannas, never get caught in the wrong hood with the wrong bandana, so now you can drive in Los Angeles, Compton, Watts, Long Beach, Inglewood, Hawthorne, Gardena, Lennox, San Perdo, Wilmington, Colton, Or an place that has a hood without having to worry about warring the wrong colors. Am I the only person who finds this amuzing and entertaining?